As Co-Founder and CEO Arnaldo leads ZPE Systems® in delivering the world’s first Software Defined Infrastructure for Console Access and Control. With more than 17 years data center experience and multiple infrastructure technology patents Arnaldo has led many market-leading product initiatives. Arnaldo delivered the first Linux based “break safe” console server, placed IPMI inside servers, architected service processor and power appliances and led enterprise software development in the Data Center Infrastructure Management (DCIM) market. 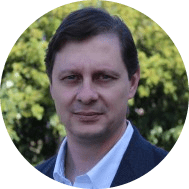 Prior to founding ZPE Systems®, Arnaldo was Director of Engineering at Emerson Network Power leading teams responsible for DCIM applications encompassing the management of all aspects of Data Center Infrastructure. Prior to this, Arnaldo held senior product development roles at Avocent and Cyclades Corporation developing award winning access and control hardware products. Over the past 16 years, Livio dedicated his professional career to design and develop innovative solutions for Data Center management. While working at Cyclades and Avocent, he provided technical leadership to deliver embedded products for Service Processors Management appliances, KVM and PDUs. Most recently as Technical Manager at Emerson Network Power, Livio led development teams in the Bay Area and abroad on both Hardware and Software DCIM products. As Co-Founder and VP of Engineering of ZPE Systems, Livio combines his commitment and the expertise accumulated through years of projects to lead the company’s R&D team and introduce new concepts of Console Access and Control for Data Center Management with the company’s flagship software, Nodegrid Manager®.